U.S. President Donald Trump’s approach to international summits is a puzzle continuing to defy solution, with the NATO meeting the latest in a list of near-critical hits to global unity, and many experts are urging Canada to continue their approach. U.S. President Donald Trump took his confrontational approach to diplomacy to the NATO summit this week, where he sideswiped his fellow alliance leaders with a litany of accusations, questionable demands on spending levels and a sudden threat to pull out of the alliance entirely. That has left national leaders — Canada's included — asking the same question they've been asking for almost two years now: what can be done to mitigate Trump's tactics? Not much, says former Conservative defence minister Peter MacKay. His advice? "Keep calm and carry on." MacKay told CBC Radio's The House today that Canada needs to keep its focus on building its military capability, contributing to NATO missions and working toward other alliance goals. Beyond that, he said, there's little anyone outside the U.S. can do to rein in the president's behaviour. "This is the new normal," MacKay said. Trump has been pushing for the 29 allied nations that make up NATO to speed up their commitment to increasing defence spending to two per cent of GDP — a goal set in 2014 with a 10-year deadline. Currently, most NATO nations aren't hitting that target. Trump emerged from the summit claiming he'd pressured the members into meeting his demands — although French President Emmanuel Macron quickly shot that claim down, pointing out that the summit communique only committed the allies to the two per cent target set before Trump was elected. Prime Minister Justin Trudeau said Canada hadn't committed to spending new money on defence at this week's meeting in Belgium, but pointed to his government's plan to increase the defence budget by 70 per cent over the next decade to $32.7 billion. In the middle of the meetings, Trump shifted the goalposts suddenly and argued that the spending benchmark should be increased to four per cent of GDP. Behind closed doors, his rhetoric was apparently alarming enough for NATO Secretary General Jens Stoltenberg to call an emergency session of leaders. 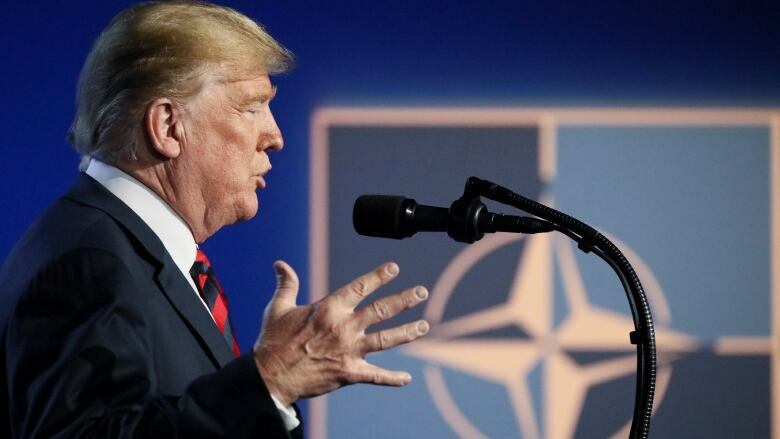 NBC News reported that Trump's threats to reassess the United States' commitment to NATO sent the Pentagon into damage control mode, with officials immediately reaching out to reassure their European counterparts. It would be "impossible" for Trump to unilaterally pull out of NATO, Ben Hodges, a retired U.S. lieutenant general who led the NATO Allied Land Command, told The House. But he can still do the alliance a lot of damage, he added. "Cohesion of the members of the alliance is our centre of gravity," he said. "It's unfortunate when any leader pounds other members." He added he thinks Trump has no understanding of how NATO works, although his advisers do. Hodges said Trump has a valid point — that allies should be spending more on defence — but his fixation on the two per cent target is blinding him to the fact that NATO partners make other types of contributions. Earlier this week, Trudeau announced that, beginning in the fall, Canada will assume command of a NATO training mission in Iraq for its first year, with a commitment of up to 250 troops and four helicopters. Trump may not count that as a contribution to the GDP goal, Hodges said — but that just shows that spending isn't the only yardstick for measuring the alliance's success. "This is not about satisfying the American president. This is about allies contributing to their share of the burden." Matt DeCourcey, Parliamentary secretary to Foreign Affairs Minister Chrystia Freeland, told The House Canada will continue to remain a "committed contributor" to NATO. That might fall on deaf ears in the U.S., but MacKay said it's an important factor in stabilizing the alliance. NATO is arguably the most important international organization Canada takes part in, and is "as important now as it ever was," he said. That emphasis on solidarity will be key heading into Monday's meeting between Trump and Russian President Vladimir Putin. "The happiest guy on the planet right now is Vladimir Putin because he's watching the American president swing a wrecking ball towards the alliance," Hodges said. "We're doing the job that Putin would normally have to do himself."